We’d love your help. Let us know what’s wrong with this preview of The Firm, the Market, and the Law by Ronald H. Coase. Few other economists have been read and cited as often as R.H. Coase has been, even though, as he admits, "most economists have a different way of looking at economic problems and do not share my conception of the nature of our subject." Coase's particular interest has been that part of economic theory that deals with firms, industries, and markets—what is known as price t Few other economists have been read and cited as often as R.H. Coase has been, even though, as he admits, "most economists have a different way of looking at economic problems and do not share my conception of the nature of our subject." Coase's particular interest has been that part of economic theory that deals with firms, industries, and markets—what is known as price theory or microeconomics. He has always urged his fellow economists to examine the foundations on which their theory exists, and this volume collects some of his classic articles probing those very foundations. "The Nature of the Firm" (1937) introduced the then-revolutionary concept of transaction costs into economic theory. "The Problem of Social Cost" (1960) further developed this concept, emphasizing the effect of the law on the working of the economic system. The remaining papers and new introductory essay clarify and extend Coarse's arguments and address his critics. To ask other readers questions about The Firm, the Market, and the Law, please sign up. Dr. Ronald Coase was one of the most influential economists of the past century. One of the seven essays collected here, "The Problem of Social Cost" is the most cited law review article ever, and a few of the other essays are almost that renowned. It is far beyond the scope of my ability to bound the limits of Dr. Coase's influence, but I can give a brief summary of the contents of this volume. The two of the most important essays are the aforementioned "Problem of Social Cost", which considers Dr. Ronald Coase was one of the most influential economists of the past century. One of the seven essays collected here, "The Problem of Social Cost" is the most cited law review article ever, and a few of the other essays are almost that renowned. It is far beyond the scope of my ability to bound the limits of Dr. Coase's influence, but I can give a brief summary of the contents of this volume. The two of the most important essays are the aforementioned "Problem of Social Cost", which considers legal rules only justified on the basis of a cost-benefit analysis and the most efficient distribution of resources. The other big essay, "The Theory of the Firm", provides the first theoretical explanation as to why firms exist, and how they are related to the rest of the market. Much of Coase's work revolves around the idea of 'transaction costs' - that is, the cost incurred in making any economic exchange. These include the cost of searching for information, of reaching agreements with other parties, and of enforcing legal and business contracts. Understanding the concept of transaction costs is, in his view, a vital part of understanding any economic system, and the institutions which arise from the arrangement of these contracts are a major subject of his analysis, and any strain of analysis which dismisses these (e.g. a focus on mathematical models or a dismissal of institutional histories) will necessarily provide an incomplete economic picture. The reason why economists went wrong was that their theoretical system did not take into account a factor which is essential if one wishes to analyze the effect of a change in the law on the allocation of resources. The missing factor is the existence of transaction costs. As I continue to re-evaluate my take on the economics of the 20th century, Coase's work stands out as well as or better than it ever did. Ronald Coase is probably my favourite economist of all time; his work is arguably as foundational as e.g. Smith's or Ricardo's and was developed over just a handful of influential and easily-digestible papers. 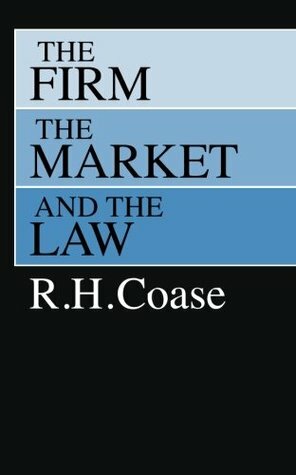 The Firm, the Market, and the Law is more or less a summary of Coase's most important work, containing his famous The Nature of the Firm and The Problem As I continue to re-evaluate my take on the economics of the 20th century, Coase's work stands out as well as or better than it ever did. Ronald Coase is probably my favourite economist of all time; his work is arguably as foundational as e.g. Smith's or Ricardo's and was developed over just a handful of influential and easily-digestible papers. The Firm, the Market, and the Law is more or less a summary of Coase's most important work, containing his famous The Nature of the Firm and The Problem of Social Cost, but also several other papers, plus ample commentary from Coase himself circa I guess ~1990. Coase died in 2013 at the ripe old age of 102. Coase was an excellent writer. All the text contained in this book is lucid and succinct. The language is plain and digestible; the sentences written as if Coase is having a lively conversation with the reader. At several places in the book Coase will quote Samuelson, or Mill, or Marshall, or maybe Pigou, or some other eminent historical economist -- their language inevitably feels wordy and jargon-laden in comparison to Coase's simple and direct prose. This makes his work extremely readable; one needs only a passing familiarity with the most basic concepts in economics in order to understand it. Classifying Coase into a particular school of economic thought is nontrivial. His work is unusual in the light of 20th century economics (this is in almost all cases a boon); it proceeds in a more classical fashion, more similar to Mises than Samuelson. Like the Austrians, Coase drives his arguments using plain, logical English, occasionally backed up with a basic arithmetical example that succinctly illustrates the problem. And like the Austrians, Coase will bluntly question the merits of the modern style of economic analysis. The Austrians characterized their economics as the study of human action, whereas Coase characterized modern economics as a study of human choice. He remarks in the opening chapter: "The preoccupation of economists with the logic of choice, while it may ultimately rejuvenate the study of law, political science, and sociology, has nonetheless had, in my view, serious adverse effects on economics itself." And he adds an irresistible quip at end of Notes on the Problem of Social Cost: "In my youth it was said that what was too silly to be said may be sung. In modern economics it may be put into mathematics." It would be wildly incorrect to classify Coase as an Austrian, of course -- cladistically he had nothing to do with that school of thought -- but like the Austrians, his methodology is more similar to that of the past than the present. It is interesting, if inconsequential, that he disliked the term 'microeconomics', preferring instead 'price theory', as I think is sensible. Unusual in modern economics is Coase's manner of proceeding with an argument in a legal manner, referring to historic cases and precedent or what have you while making what is an ultimately economic argument. Coase's herculean attention to real-world facts and details also greatly distinguishes his work; his last essay in this book, The Lighthouse in Economics, is a meticulously-researched discussion on the history and economics of lighthouses in Britain. While this might also make an excellent conversation leader for Buzz Killington, it is a testament to Coase's ability that it remains readable, entertaining, and insightful (the level of detail here is probably even more extreme than in something like Michels' Political Parties, which felt comparatively unpleasant). Much of Coase's work is perhaps best-summarized by the following question: what happens when there exists a cost to using the market? The answers are more profound than one likely expects at the outset -- such transaction costs are not merely an annoyance or some kind of tax, but they are responsible for the vast majority of the economic structure we actually observe in the world. Coase summarizes his argument from The Nature of the Firm: ".. although production could be carried out in a completely decentralized way by means of contracts between individuals, the fact that it costs something to enter into these transactions means that firms will emerge to organize what would otherwise be market transactions whenever their costs were less than the costs of carrying out the transactions through the market." In short: sufficient transaction costs can make politics cheaper than exchange, and so we observe the formation of organizations, firms, and even states. Coase only hints slightly at the latter ("the government is, in a sense, a super-firm"), but the deduction is immediate. This observation by Coase -- that transaction costs are a kind of agglomerative phenomenon; a gravity or manifold hypothesis of economics -- does wonders to snap together various schools of thought. As soon as we assume some sort of effective legal substrate (such that violence between agents is safely ruled out of any analysis) we have that transaction costs produce economic structure -- "islands of conscious power", as Coase puts it -- in the form of firms and other organizations. And within those structures we can invoke Michels' 'Law of Oligarchy' to predict their own organization -- an inevitable movement towards hierarchy. And then we can consider dynamics and strategies of agents within those organizations -- entryism, politics (à la de Jouvenel), and so on. But the overarching concept that drives the formation of organizations in an economic (i.e. price) system is transaction costs, which is not immediately obvious, and which for pointing out Coase largely won the Nobel prize. In Industrial Organization, Coase points out the more obvious fact that the 'cost of politics' increases rapidly as an organization scales: ".. an increase in the activities organized within the firm tends to produce strains within the administrative structure which raise the costs of organizing additional operations (even if similar to those already undertaken): the rise in cost occurs both because the administrative costs themselves rise, and because those making decisions make more mistakes and fail to allocate resources wisely." This sets some sort of natural pressure on the size of a firm: ".. a firm will tend to expand until the costs of organizing an extra transaction within the firm become equal to the costs of carrying out the same transaction by means of an exchange on the open market or the costs of organizing in another firm." Aside from the study of transaction costs as an agglomerative phenomenon, Coase's most famous other work is on the problem of externalities. Here one is concerned that some market transaction produces an external cost (or benefit) that is not priced into the transaction itself, and is instead borne (or enjoyed) by some third party. The 'Pigouvian' interventionist approach, advocated initially by Pigou and then supported by seemingly most mainstream economists throughout the 20th century and to this date, is certainly viewed as the 'traditional' response to the problem of externalities. The idea of a Pigouvian mechanism is that when market transactions produce so-called 'negative' externalities -- in the form of pollution, noise, etc. -- the cost of the externality ought be offset by a tax (a carbon tax is probably the most popular example). Similarly one can imagine a Pigouvian subsidy, in which, say, a government determines that some good like education with (supposedly) positive externalities ought be subsidized so as to produce more of it (here I would be remiss to point out Caplan's recent work in The Case Against Education, which I have not yet read, but surely agree with). Coase's treatment of externalities and the Pigouvian mechanism in The Problem of Social Cost is seminal and, to me, convincing. Coase summarizes: "It is my contention that the suggested courses of action are inappropriate in that they lead to results which are not necessarily, or even usually, desirable." Coase's fundamental observation -- which seems to this day to be ignored by far too many mainstream economists -- is that implementing a Pigouvian mechanism itself has costs, which indeed may be enormous, and which -- if they could even be known accurately, which they typically can't -- may often dwarf the costs of the externality itself. Coase quotes Baumol at one point, who summarizes the problem concisely: "We do not know how to calculate the required taxes and subsidies and we do not know how to approximate them by trial and error." Coase follows this himself: ".. the problem is to devise practical arrangements which will correct defects in one part of the system without causing more serious harm in other parts." Coase comments on Pigou's theoretical analysis of externalities as valid: "the Pigouvian analysis shows us that it is possible to conceive of better worlds than the one in which we live." But the problem with a Pigouvian mechanism is that it is typically illustrated on a blackboard in the context of perfect competition as if by an omniscient entity who observes the world perfectly and can modify it at will. This is typically an inadmissible detachment from the world as it is, and, as a normative prescription (which it seems to be frequently advocated as) ignores transaction costs, property rights, legal frameworks, the calculation problem, and so on. As such, the Pigouvian mechanism is rarely implementable in a real-world legal and economic framework. Coase criticizes it rightly: "It is my belief that the failure of economists to reach correct conclusions about the treatment of harmful effects cannot be ascribed simply to a few slips in analysis. It stems from basic defects in the current approach to problems of welfare economics. [..] This approach inevitably leads to a looseness of thought since the nature of the alternatives being compared is never clear." Coase summarizes what became known as the Coase theorem as follows: in the absence of transaction costs, ".. when dealing with the problem of the rearrangement of legal rights through the market [..] such a rearrangement would be made through the market whenever this would lead to an increase in the value of production." But, importantly, Coase did not omit an analysis of the case under transaction costs: "Once the costs of carrying out market transactions are taken into account, it is clear that such a rearrangement of rights will only be undertaken when the increase in the value of production consequent upon the rearrangement is greater than the costs which would be involved in bringing it about." As a bit of a tangential comment here -- aside from its contributions to the subject, The Problem of Social Cost is a wonderful paper in terms of its methodology alone -- in it Coase proceeds like a legal scholar, moving in detail through a number of cases in the common law that illustrate the economic phenomenon of externality in the presence of a system of legal rights and transaction costs (and with some humour as well -- on one case regarding pollution emitted from a fish & chips stand, Coase notes "England without fish-and-chips is a contradiction in terms and the case was clearly one of high importance."). Coase peppers these case analyses with raw economic analysis in very satisfying fashion, and one that I have not seen any other writer do to the same degree (although Mises in The Theory of Money and Credit comes somewhat close). He achieves an excellent balance and is careful to bring the (presumed-economist) reader along with him, e.g. "The reasoning employed by the courts in determining legal rights will often seem strange to an economist, because many of the factors on which the decision turns are, to an economist, irrelevant." Anyway. This legal analysis is material in Coase's summary of his argument. Resuming from the previous: "When [the cost of bringing about a rearrangement of rights] is less [than the consequent increase in the value of production], the granting of an injunction (or the knowledge that it would be granted) or the liability to pay damages may result in an activity being discontinued (or may prevent its being started) which would be undertaken if market transactions were costless. In these conditions, the initial delimitation of legal rights does have an effect on the efficiency with which the economic system operates." Since the law is not about "what shall be done", but "who has the legal right to do what", the Pigouvian mechanism often borders on a being a legal non-sequitur. As one of his alternate solutions to the problem of externalities, Coase invokes his previous work on transaction costs: ".. where contracts are peculiarly difficult to draw up [..] it would be hardly surprising if the emergence of a firm or the extension of the activities of an existing firm was not the solution adopted on many occasions to deal with the problem of harmful effects." He goes on to discuss the matter of government intervention via non-Pigouvian mechanisms: "It is clear that the government has powers which might enable it to get some things done at a lower cost [..] But the government administrative machine is not itself costless. It can, in fact, on occasion be extremely costly. Furthermore, there is no reason to suppose that the restrictive and zoning regulations, made by a fallible administration subject to political pressures and operating without any competitive check, will necessarily always be those which increase the efficiency with which the economic system operates." Contra those who would peg him as a zealot or some such, though, Coase does suggest situations in which regulation may be desirable -- when for example "a large number of people is involved and when therefore the costs of handling the problem through the market or the firm may be high". Coase also suggests a further important alternative, which is to do nothing about a problem at all: ".. there is no reason to suppose that governmental regulation is called for simply because the problem is not well-handled by the market or firm." Indeed. This is the classic collection of Coase's critical papers. He was one of the first to talk about "transaction costs" in economics and this volume has his key papers, which won him the Nobel Prize in the 1990s. They are dense, but accessible with little or no math/calculus. There are some cool ideas, but it took the Econ profession 50+ years to appreciate him fully so be prepared to think a bit. A short collection, but a slog! Not for the timid. Every essay is a gem. I use this as the core text in MC 241: Politics and Markets, which is an introduction to political economy or what I might prefer to call economic governance. This is a stand-in for Coase's "The Nature of the Firm" which is not on Goodreads at present. This review has been hidden because it contains spoilers. To view it, click here. The beginning was really good and then it just became real technical and I totally lost interest. The most important thing was the idea of transaction costs their relation to the existence of the firm. Interestingly, Coase thought that this was one of the least important parts. On thing that I think even Coase's tcosts miss in the organization of the firm is human psychology. Fear, uncertainty, lack of leadership ability, these could all lead to the seeding of firms. "A man who has nothing The beginning was really good and then it just became real technical and I totally lost interest. "A man who has nothing to worry about immediately busies himself in creating something, gets into some absorbing game, falls in love, prepares to conquer some enemy, or hunt lions or the North Pole or what not." "Transaction costs: In order to carry out a market transaction it is necessary to discover who it is that one wishes to deal with, to inform people that one wishes to deal and on what terms, to conduct negotiations leading up to a bargain, to draw up the contract, to undertake the inspection needed to make sure that the terms of the contract are being observed, and so on. Dahlman crystallized the concept of transaction costs by describing them as "search and information costs, bargaining and decision costs, policing and enforcement costs."" "In my article on "The Nature of the Firm" I argued that, although production could be carried out in a completely decentralized way by means of contracts between individuals, the fact that it costs something to enter into these transactions means that firms will emerge to organize what would otherwise be market transactions whenever their costs were less than the costs of carrying out the transactions through the market. The limit to the size of the firm is set where its costs of organizing a transaction become equal to the cost of carrying it out through the market. This determines what the firm buys, produces, and sells." Another book where I understood enough to know that it was interesting and meaningful but probably did not get all of it. It seems like a lot of Coase's analysis could go both ways on the question that really interests him: when should the government "intervene" in "market" transactions. Coase generally thinks that the answer is never or a lot less than what he perceives as the dominant economic thinking stemming from Pigou would have you believe. More important than his prior/conclusion, though Another book where I understood enough to know that it was interesting and meaningful but probably did not get all of it. It seems like a lot of Coase's analysis could go both ways on the question that really interests him: when should the government "intervene" in "market" transactions. Coase generally thinks that the answer is never or a lot less than what he perceives as the dominant economic thinking stemming from Pigou would have you believe. Classic economic papers. "The Nature of the Firm" attempts to explain why people form companies. This is interesting to me because the benefits of a firm largely come from reducing certain costs, and technology has reduced some (but not all) of those costs. It's possible to make predictions about the size of firms as those costs continue to drop, and it's interesting to see those predictions come true. If you're into economics, this book is a must read at some point. It includes Ronald Coase's two most famous papers: "The Nature of the Firm" and "The Problem of Social Cost". It also includes additional commentary about what he says in them, and some other papers, such as "The Lighthouse in Economics". This is a classic of economic theory. Coase won the Nobel prize for it. To distill it down, its walmart economics--firms will choose to acquire facets of their business process (for example a retailer may buy a shipper), or they will compete with the shipper on either price or anti-trust. This is a free-market economics classic. this is a set of articles that made transactions costs an axiom in microeconomics. Really heavy grit...almost want to call it a textbook but can't bring myself to do so out of fear that someone might choose not to read on that basis. Oops...I think the cat just got out of the bag. Ronald H. Coase passed away on September 2, 2013, at the age of 102. At the time of his death, Professor Coase was the Clifton R. Musser Professor Emeritus of Economics at The University of Chicago Law School. Ronald H. Coase’s 1937 paper “The Nature of the Firm” was to establish the field of transaction cost economics. “The Problem of Social Cost,” published in 1961, sets out what is now known as t Ronald H. Coase passed away on September 2, 2013, at the age of 102. After holding positions at the Dundee School of Economics and the University of Liverpool, R. H. Coase joined the faculty of the London School of Economics in 1935. He continued at the London School of Economics and was appointed Reader in Economics with special reference to public utilities in 1947. Mr. Coase has held both a Sir Ernest Cassel Traveling Scholarship and a Rockefeller Fellowship. He has also been a Fellow at the Center for Advanced Study in the Behavioral Sciences, Stanford, California. During World War II, he served as a statistician with the Central Statistical Office of the Offices of the British War Cabinet. In 1951 Mr. Coase migrated to the United States and held positions at the Universities of Buffalo and Virginia prior to coming to the Law School in 1964. He has taught regulated industries and economic analysis and public policy. Mr. Coase was the editor of the Journal of Law and Economics from 1964 to 1982. Among his many publications are The Firm, the Market and the Law (1988) and Essays on Economics and Economists (1994). In 1977 Mr. Coase was a Senior Research Fellow at the Hoover Institution, Stanford University. Mr. Coase is a Fellow of the British Academy, the European Academy, and the American Academy of Arts and Sciences. He is a member of the Honour Committee of Euroscience. He holds honorary doctorate degrees from the University of Cologne, Yale University, Washington University, the University of Dundee, the University of Buckingham, Beloit College, and the University of Paris.